It’s the beginning of Spring and this March we have plenty lined up for you to get ready for the onset of the Cherry Blossom season! 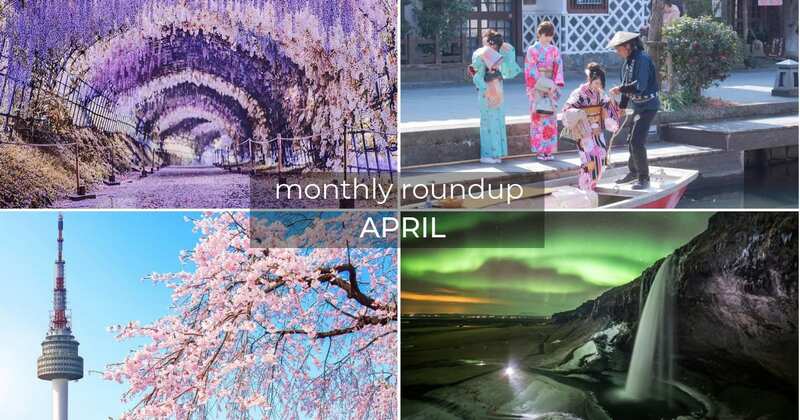 As we see the world turn millennial sakura pink on one side, on the other side of the world, get ready for beautiful snow capped alps and the elusive Northern Lights! If you’re looking for somewhere closer to home, Bangkok gets ready for the much anticipated Songkran water festival! 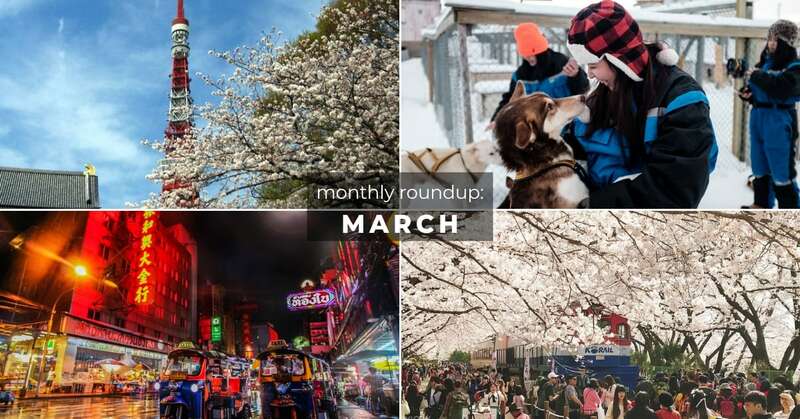 You can’t talk about Cherry Blossom season without mentioning Japan and one of the best cities to visit during sakura season is definitely Tokyo! Whether you’re planning to stay in the city or head out you can’t miss these pink beauties. 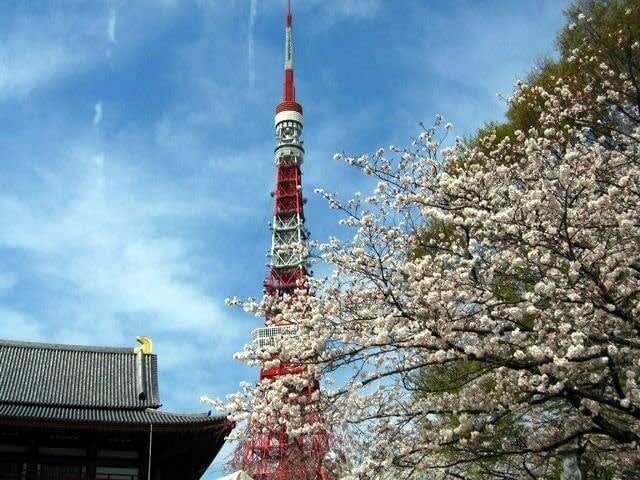 Head over to the Tokyo Skytree for an aerial view of the blooms from the observation decks. If you prefer the majestic Mount Fuji as the backdrop to your photos, we’d suggesting opting for one of our Mount Fuji Cherry Blossom tours! 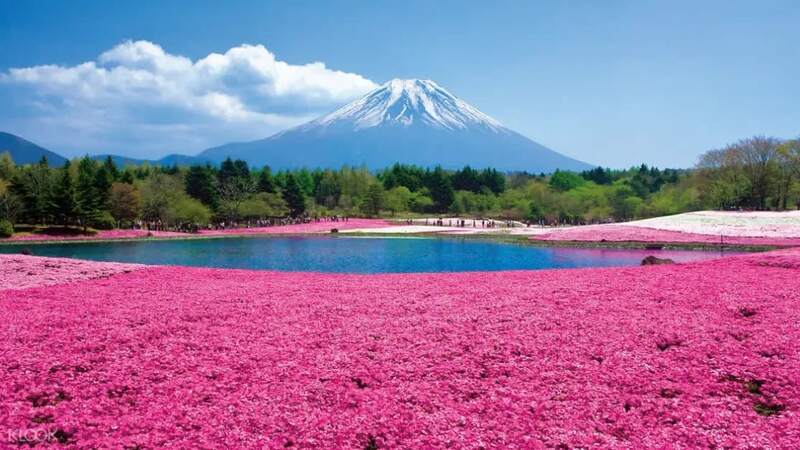 Let the sakura experts take you to some of the best kept secret viewing spots where you can take postcard worthy pictures of the sakura flowers and Mount Fuji. Check out our Cherry Blossom forecast and best viewing spots for Japan guide to ensure you’re in the right city at the right time! You definitely would not want to miss full bloom. 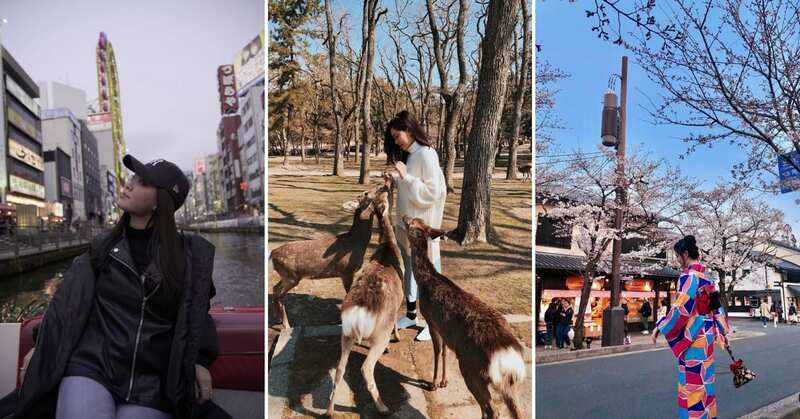 #KlookTip: Level up your Cherry Blossom photo with by donning a Kimono! 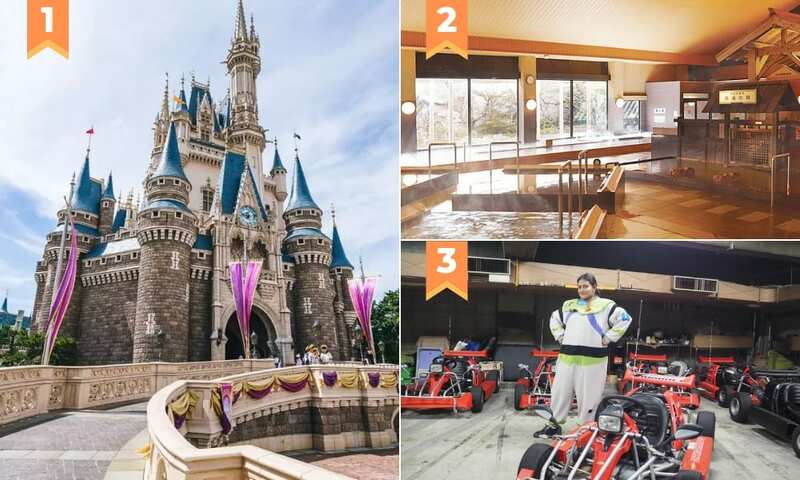 Tokyo Disneyland or Tokyo DisneySea – You can’t miss a trip to the ONLY DisneySea in the world! 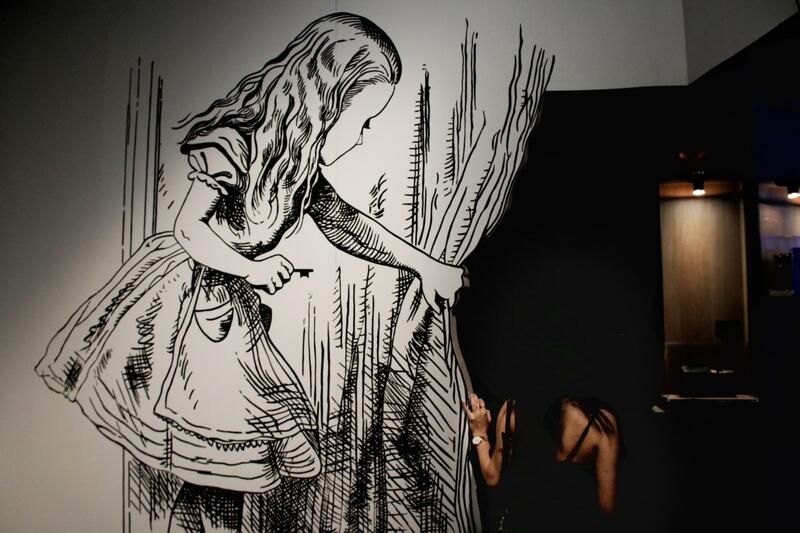 Get up close and personal with some of your favourite Disney characters on a magical day out. P.S. You definitely would not want to miss the Haunted Mansion Ride. Oedo Onsen Monogatari – A quintessential Japanese experience is soaking your worries away in a hot spring. The Oedo Onsen is one of Tokyo’s best natural onsen theme parks with over 13 different baths available. Street Karting at Akihabara – Live out your Nintendo dreams and race around the bustling streets of Akihabara in a street go kart! Put on outfits after the cutest characters you’ve seen in your childhood. Remember safety first – no banana peels or evil mushrooms will be given. - Visit Tokyo DisneySea - the only DisneySea in the world! What to eat - Fill your bellies for under SGD15 in Tokyo! - Make your own sushi! The sakura in South Korea are equally impressive and one of the most famous Cherry Blossom festivals in Korea is the Jinhae Cherry Blossom Festival! 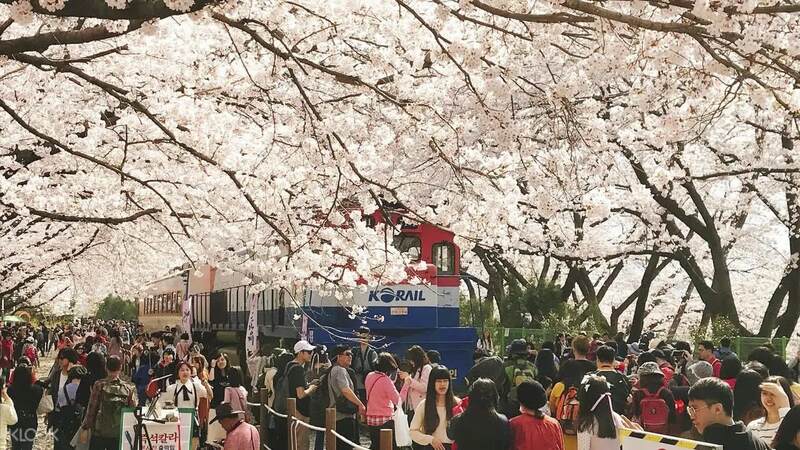 Pre-book your Jinhae Cherry Blossom tour from Busan and let the expert guides take you the best viewing spots in town. Be sure to take a photo at the iconic Gyeonghwa Rail Station Bridge! 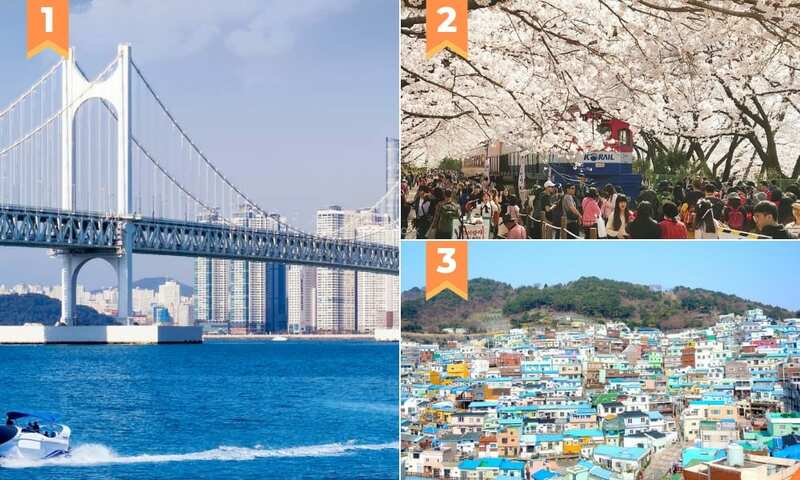 Refer to our Cherry Blossom forecast and best viewing spots in Korea for more places to add to your Cherry Blossom adventures. Busan Skywalk – Take in the vast views of the harbour from the Busan Skywalk! You’ll surely be dazzled by the waves under your feet. You’ll even drop by the Gamcheon Culture Village where you might spot The Little Prince hanging out. Fairytale Village Jeonggo Wall – The Jeonggeo Wall Painting Village is a charming small fishing village that many flock to after it gained popularity for appearing on the Taiwanese TV Show “Marry Me or Not?”. Jinhae Cherry Blossom Festival – The Jinhae Cherry Blossom Festival is one of the most popular times to visit Jinhae. 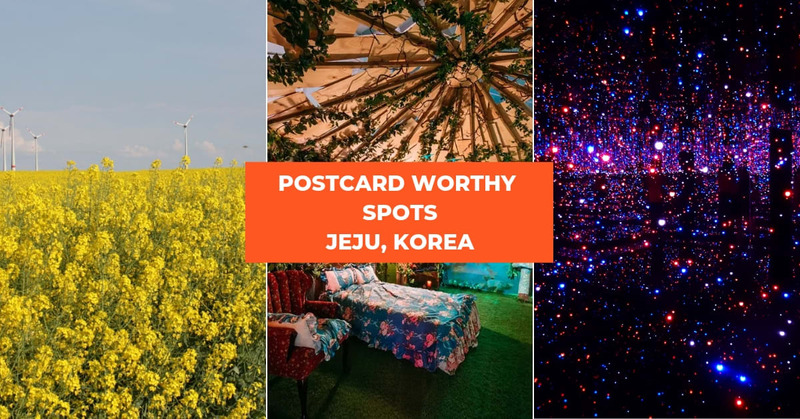 While not exactly in Busan, this tour includes a roundtrip transfer from Busan and all other transportation, allowing you to chase the elusive pink blooms all day! What to do - Attend a Korean cooking class! 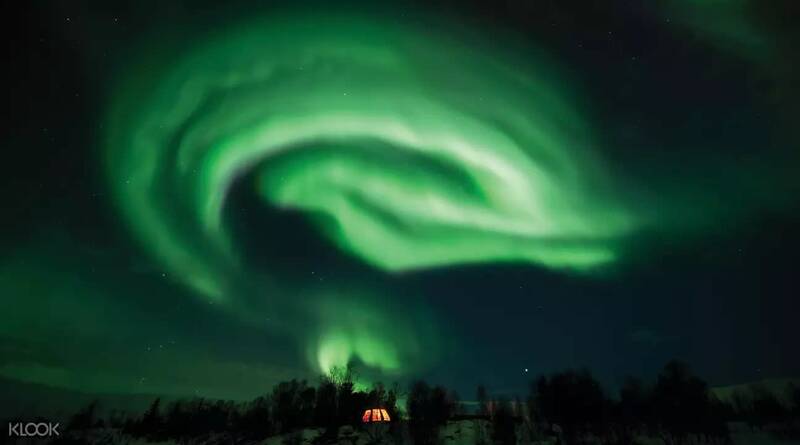 Apart from Sakura season, it is also Northern Light season up in the North and one of the best places to catch the elusive beauty is in Tromso, Norway! Join one of our Northern Light tours and let the experts take you on a chase for the lights. They’ll even offer expert tips on how to best capture the lights on your cameras and even take photographs for you. Travel around in a comfortable bus with on board restrooms and enjoy snacks and hot beverages along the way. After all, if you’re not a confident driver, we definitely would not recommend driving on the icy dark roads on your own. 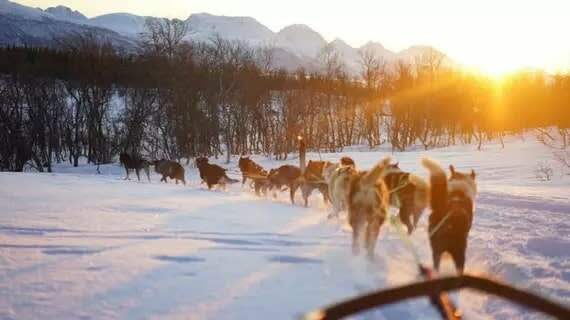 Another recommended activity in Tromso is definitely Husky Sledding! Sled through the alps as you get pulled along by the cutest huskies ever. They are all extremely friendly and love belly rubs! Check out our first timer’s guide to Tromso for some must visit spots and must try food! #KlookTip: Pack your warmest coats and woolies and your best moisturiser because the winter up there can be pretty harsh! 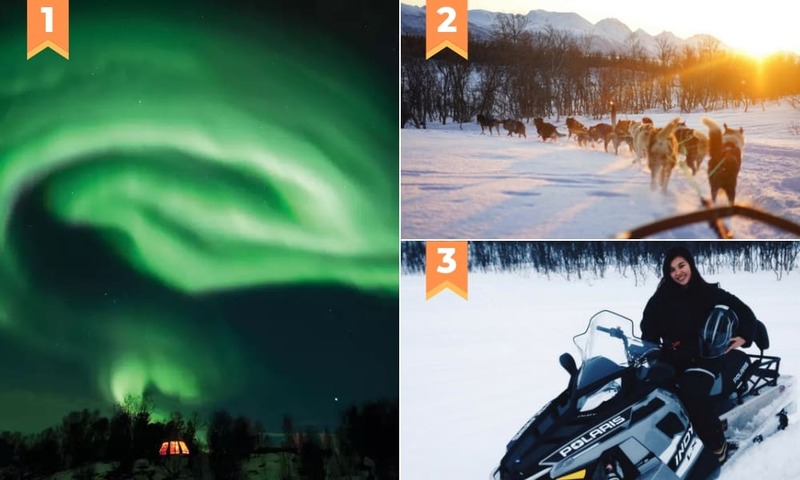 Northern Lights Chase – The biggest reason people travel up north and withstand the harsh winter is because of the majestic Aurora Borealis – Northern Lights. Enjoy hot beverages and snacks on board a comfy bus as the experts take you to the hotspots of the night. 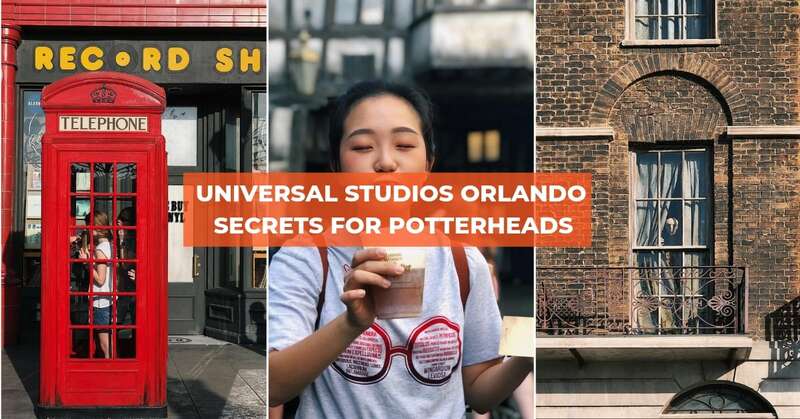 If you’d like to take a piece of that memory home, be sure to get the guides on the tour to help you take plenty of photographs! 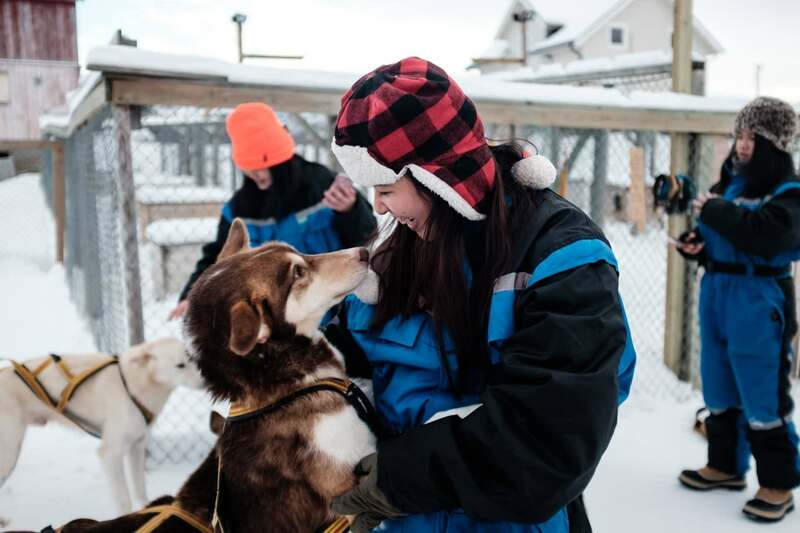 Husky Sledding – Get up close with the center’s 300 fluffy huskies and get ready to drown in affection! You’ll get the opportunity to drive your own dog sleds and even ride pillion on a sled while your friend drives. Snowmobiling – Nothing beats racing through the alps on a snowmobile! Ride over frozen lakes that takes you across the borders of Norway, Finland and Sweden. Experience true arctic beauty as you speed across the Lapland’s glistening fjords. Where to stay - Level up your visit with a stay at these epic hotels and you might even catch the lights from the comfort of your beds. If you’re looking for some splashing good fun, the Songkran festival makes Bangkok the perfect destination this April. 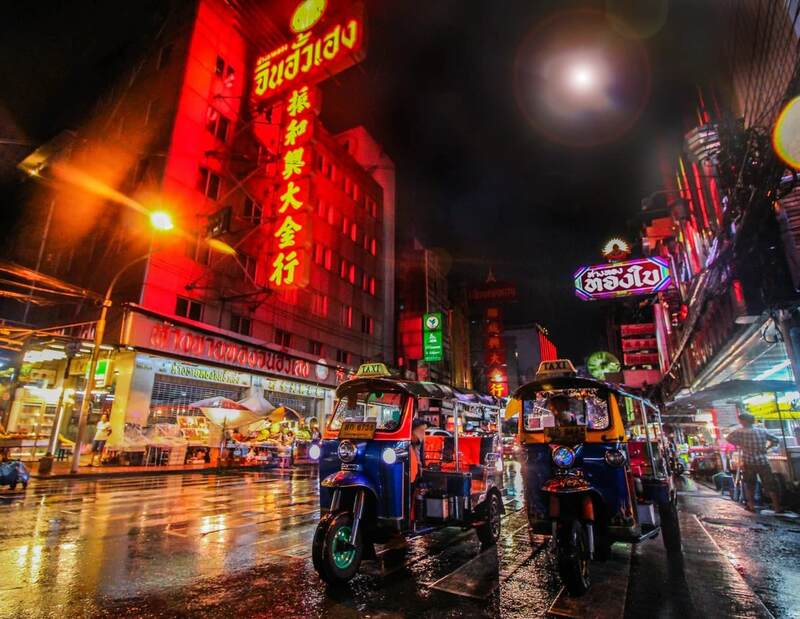 Apart from the usual shopping at Chatuchak market, temples and Thai cooking classes, check out some new and exciting things to do in Bangkok! SEA Life Bangkok Ocean World – Hop onto at SEA Life Bangkok and watch over 400 different species of sea creatures swim beneath your seat. You’ll even get to feed penguins, otters and water rats on your visit! 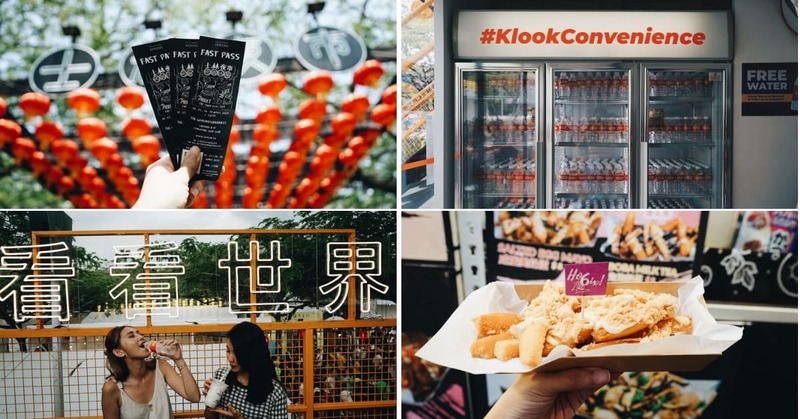 Damnoen Saduak Floating Markets – Take a peek into the lives of the locals at the Damnoen Saduak Floating Markets where you’ll find stalls selling everything under the sun! Whether you’re looking for a snack or looking to take home a handcrafted souvenir, you’ll find it there. Mahanakhon Skywalk – Enjoy stunning panoramic views of the capital city as you stand at the top of Bangkok’s highest point. 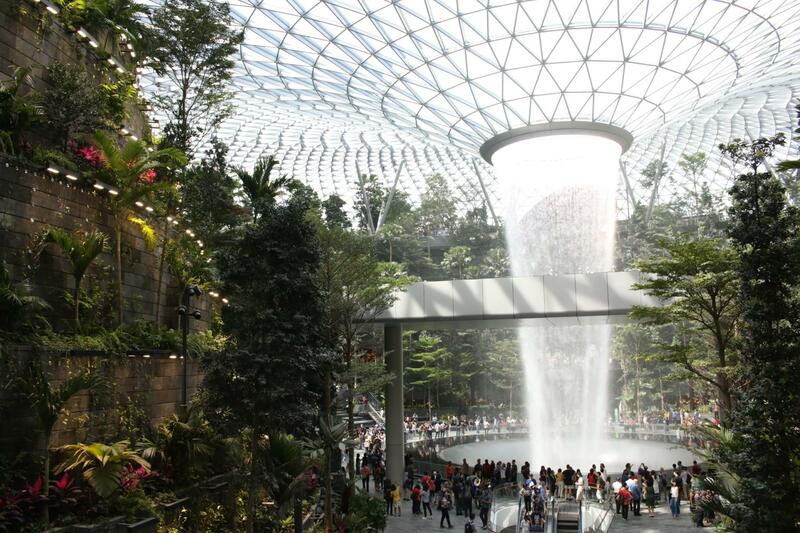 This skywalk is strictly for the bravest hearts only – a transparent glass section juts out of the building and if you’re up for it, we dare you to lie down for a selfie! What to do - Reward yourself with one of these cheap Bangkok massages under SGD30. 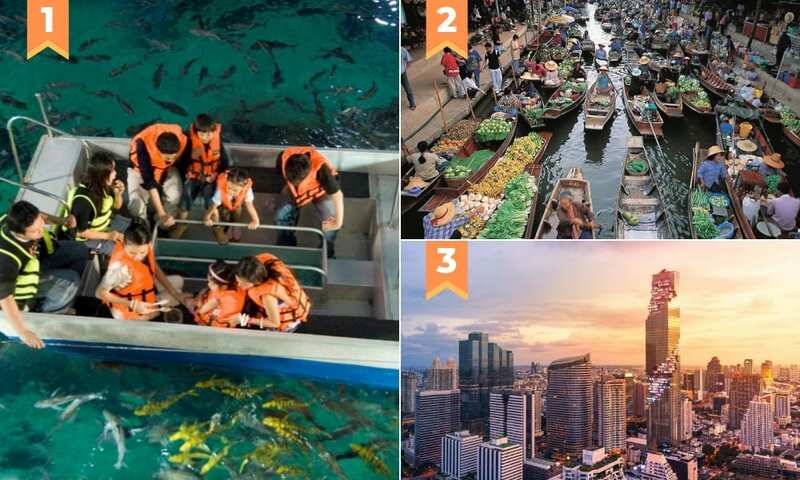 - New attractions in Bangkok you can’t miss! What to eat - Fill your bellies with some of the best local food. Essentials - Pick up these travel essentials from the Bangkok airport upon landing! Struggling to clock those 10,000 steps a day? 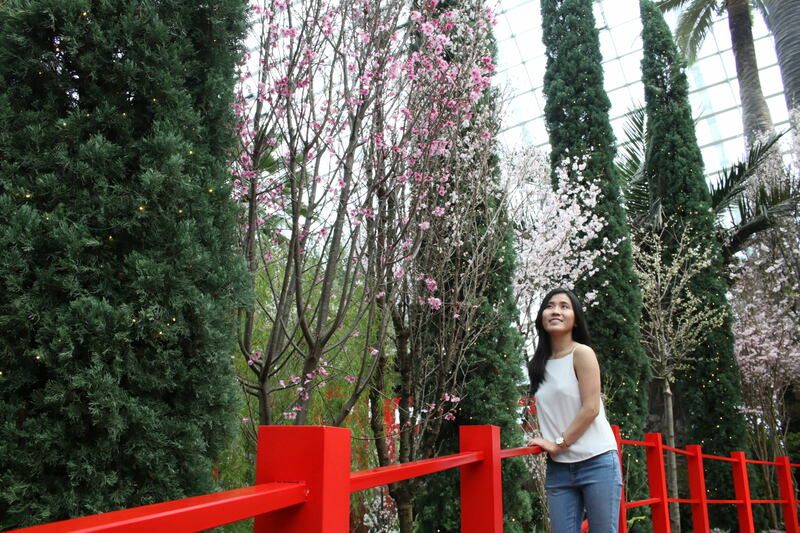 Head over to Changi Airport and take part in the Cherry Blossom Chase! Cycle through rows of sakura trees or run your best laps to power up Japan Rail trains and step into a wind chamber to try and grab as many sakura petals as you can. Did we forget to mention that you can win up to $1000 worth of Klook vouchers? Find out how! 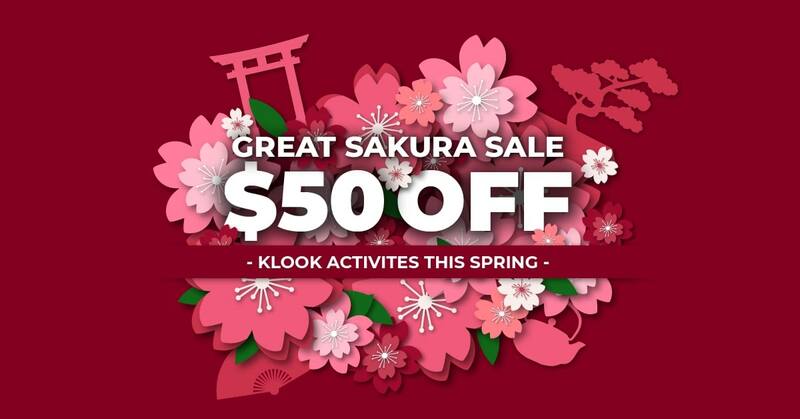 Enjoy up to $50 off sitewide on Klook with our Great Sakura Sale! Simply spend $200 and key in the code “KLOOKGSS15” to enjoy $15 off or spend $400 and key in the code “KLOOKGSS35” to enjoy $35 off! Find out more details on how to unlock the $50 off here! Good news for all AMEX cardholders! 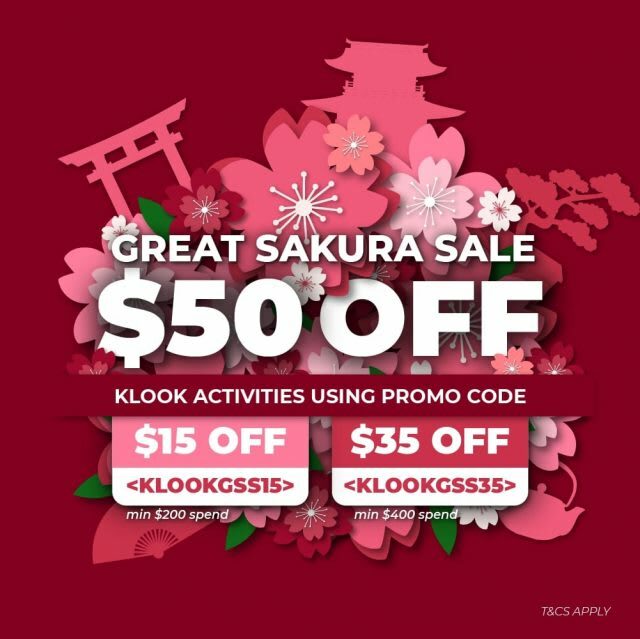 Save even more this sakura season from 3 – 10 March, with up to $40 off your Klook activities. 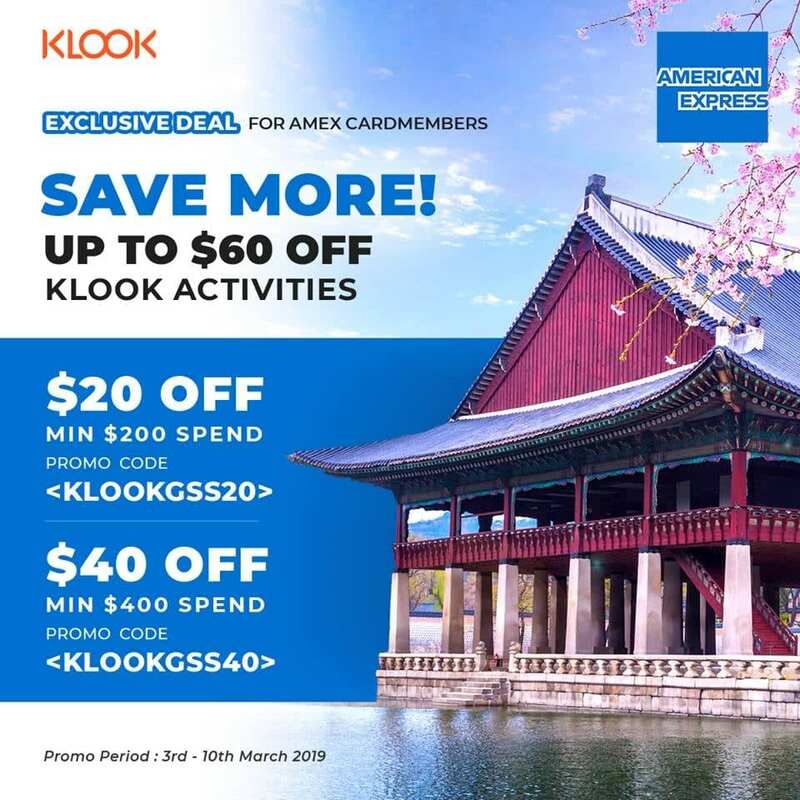 Just use the code KLOOKGSS40 with a minimum spend of $400, or KLOOKGSS20 with a minimum spend of $200. 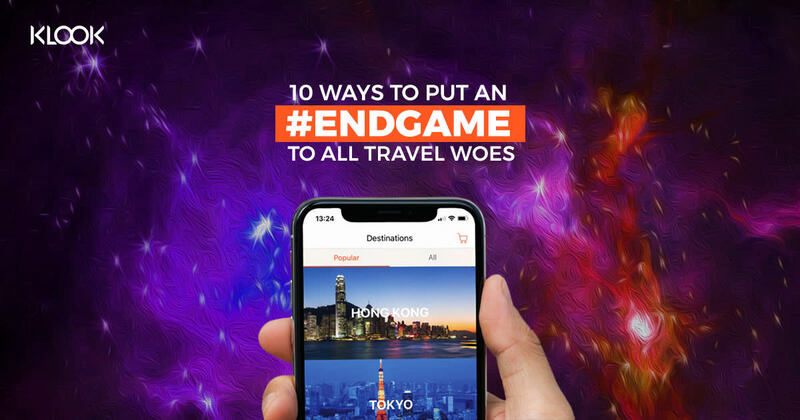 Now that you’ve got your promo codes and your holiday destinations all laid out, head on over to Klook your next holiday! 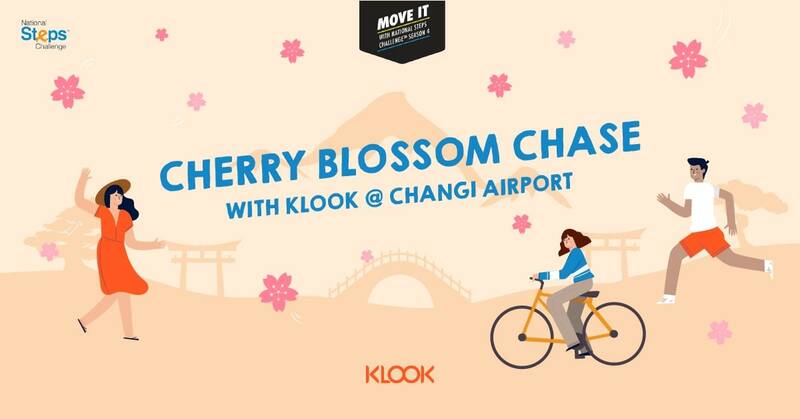 Previous post Win Up To $1000 Worth Of Klook Vouchers At The Cherry Blossom Chase @ Changi Airport!